Employment Rights Now | AIER. In Employment Rights Now, the latest publication from the Australian Institute of Employment Rights, some of Australia’s most expert academics, unionists, lawyers and other practitioners evaluate the current status of Australia’s industrial relations system. 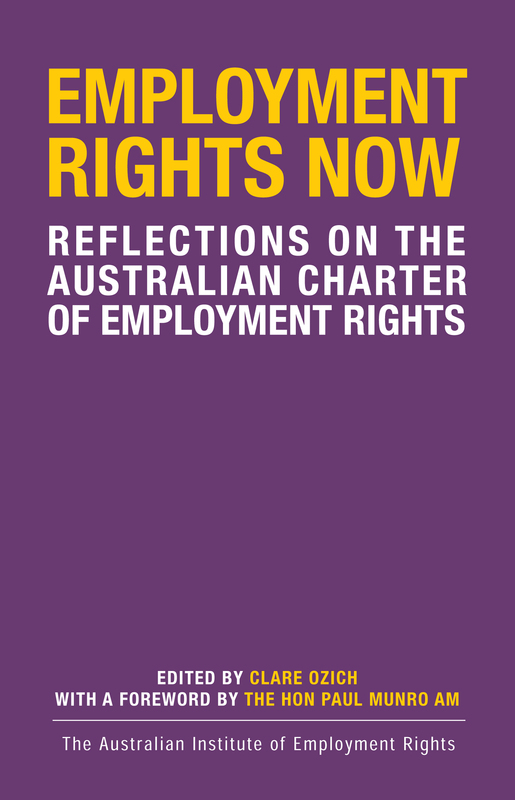 Instead of being situated in the neo-liberal framework of economic efficiency, Employment Rights Now applies the rights-based principles set out in the Australian Charter of Employment Rights. The Charter is based on international labour standards, the Australian concept of a “fair go” at work, and relevant common law principles. 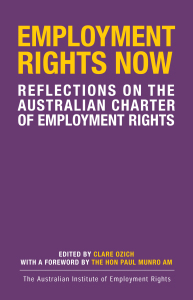 Employment Rights Now contains a chapter on each of the ten Charter principles including freedom from discrimination and harassment, freedom of association, protection from unfair dismissal, fairness and balance in industrial bargaining and effective dispute resolution. There is also exploration of the not-uncontroversial position that sits at the core of the Charter that labour rights are human rights. Contact AIER to purchase a copy. See here for more details. Also available as an ebook from Amazon, Kobo or via the iBooks app.